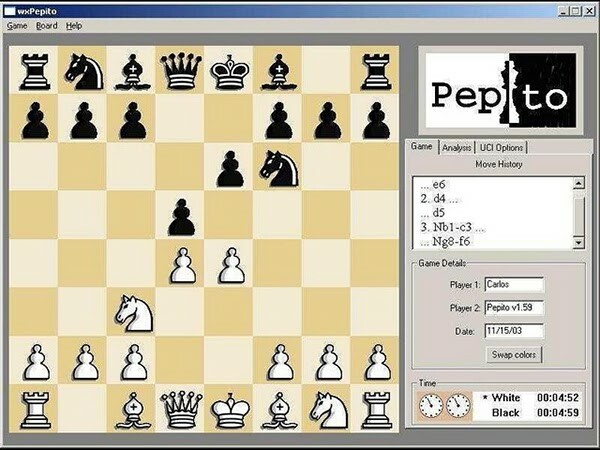 a Chess Engine Communication Protocol and UCI compliant open source chess engine written by Carlos del Cacho in C, first released in September 2000 . The recent version comes with an own GUI written in C++ using wxWidgets and can create opening book databases from a pile of thousands of chess games, applying advanced data structures such as B-trees and skip lists . As bitboard engine, Pepito applies rotated bitboards with 1/2 MiB lookup tables, indexed by the full 8-bit line occupancy, to determine sliding piece attacks. Pepito played the CCT4, CCT5 and CCT6 tournaments. The program Siboney by Francisco Rivera published in 2002 was based on Pepito with a changed evaluation   . In 2003, Deep<9> by pretended author Denis Grafen was proven a blatant clone of Pepito   . This page was last edited on 27 February 2019, at 09:27.